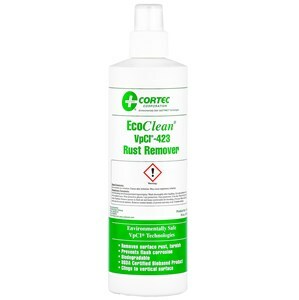 Cortec ECOClean 423 Rust Remover is a water based, non-toxic gel that removes rust from steel, iron, copper, brass and chrome. Ideal for hard to reach or vertical surfaces. Non-polluting. This viscous liquid uses natural organics to remove rust, scale and oxides. Loosens rusty parts and stops flash rust. Biodegradable. 16 fl. oz. bottle. EcoClean products attack the toughest maintenance duties with respect for the environment. They incorporate nontoxic, biodegradable chemicals without aerosols, propellants, or ozone-depleting CFCs. Fast-acting, dependable, and safe to handle, EcoClean products lead the way in environmentally safe technology. Unlike other products currently available, these formulations are not based on hazardous acids, and when used correctly will not harm human skin or adversely affect most paints, plastics,wood, textiles, ceramics or rubber. Cortec EcoClean products do not contain propellants, CFCs or HCFCs that affect the atmosphere, ozone layer or environment. When possible, EcoClean products are formulated with ingredients rated for their biodegradability and non-polluting characteristics, minimizing waste disposal. EcoClean products have no storage or added fire insurance restrictions. They can be stored like any non-aerosol lubricant or cleaner at room temperature. Do not let product freeze. EcoClean products are non-hazardous and can be shipped by air freight or any other conventional shipping method. EcoClean products have been specially formulated to improve safety for the consumer as well as the environment. The products do not contain 1,1,1 trichloroethane, methylene chloride or chlorinated solvents. EcoClean products are packaged in 16 fluid ounce (0.5 liter) recyclable bottles.